Yes, clinging to that cliff up there are my husband and Teen14. Me? I’m the numpty down on the ground taking the photos. But next time, for sure I’m heading up there. 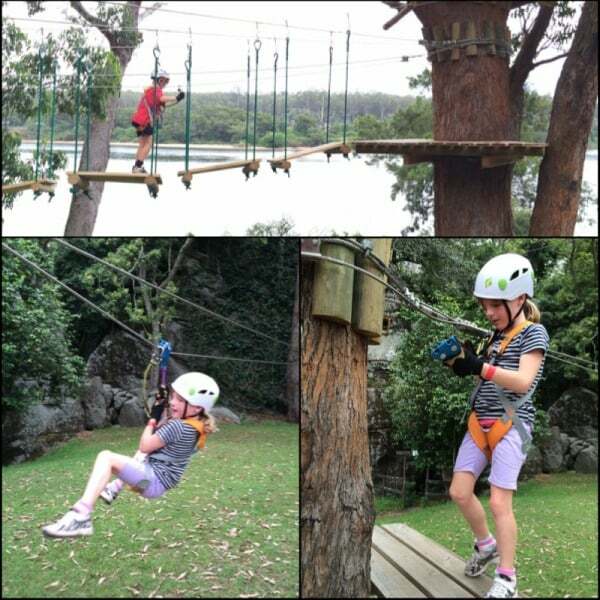 When we were down at Jervis Bay in January, we took up a generous offer to try out the new Trees Adventure courses in Nowra. 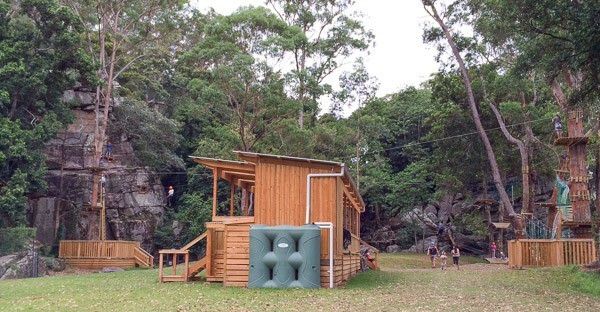 There’s a really unique experience for the bold adventurer here as the ropes courses are set up through trees and along cliffs as well. The location is fab too. 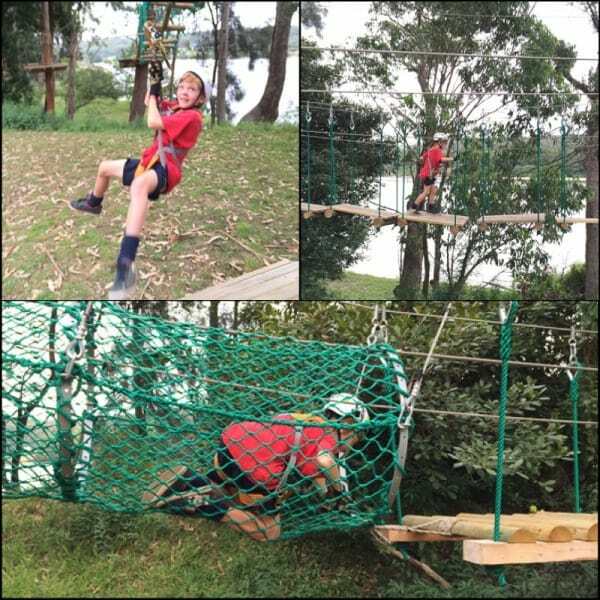 The courses are within the grounds of Shoalhaven Zoo, right alongside the wide and langorous Shoalhaven River. Here follows lots of photos and info plus all the contact information at the end of the post. Here follow some photos of the two of them monkeying around. 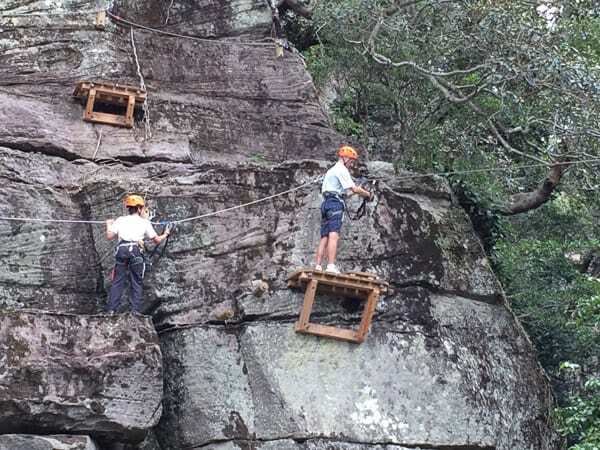 The twins are strong and brave little dudes and were desperate to try the tougher courses. They asked, begged and cajoled… but the guides were firm; they need to wait until they are eight to try the green and blue courses. Safety is paramount here, and sticking to the age limits is crucial to that. Don’t worry kids, we’ll be back after your birthday. By the way, the briefings were good at Trees Adventure and the equipment was terrific. All climbers wear safety harnesses which cannot be detached at all whilst on the courses. Great to see: my husband hasn’t got much life insurance. On the yellow courses, a parent or carer has to stay on ground level to keep an eye on the children. 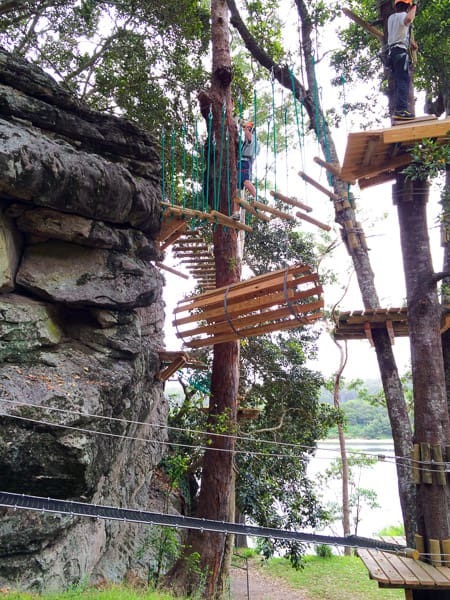 So that’s why I was down below whilst everyone else was swinging around the treetops, climbing though nets, crossing rope bridges and flying down zip lines. 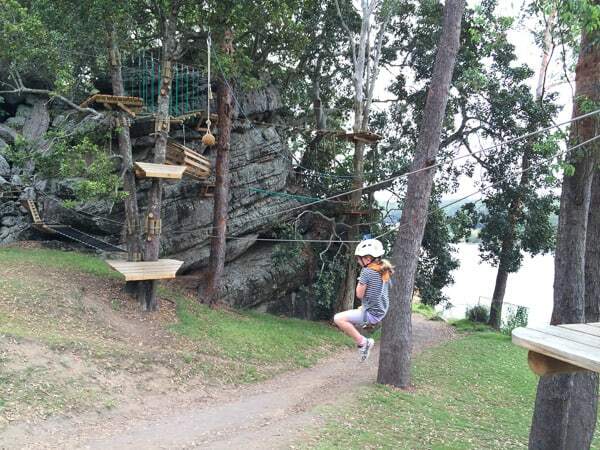 Children aged eight and over can go on the green and blue courses: one adult must climb with every four children. I’ll be there! The red course is for adults and children aged ten and over. The black course is for adults and teenagers aged 13 and over. The green and blue course start from the top platform up there. 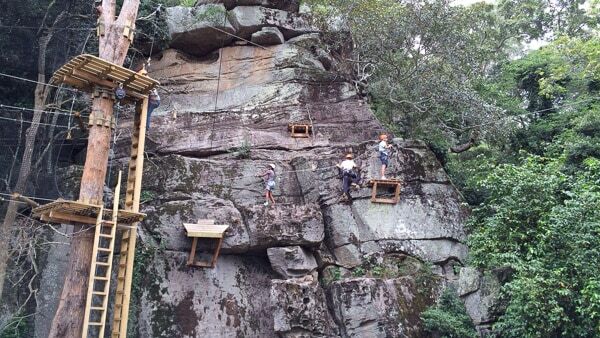 The courses here are 6 – 8m high; Paul and Dexbox started up there just to get the hang of the place- sorry. 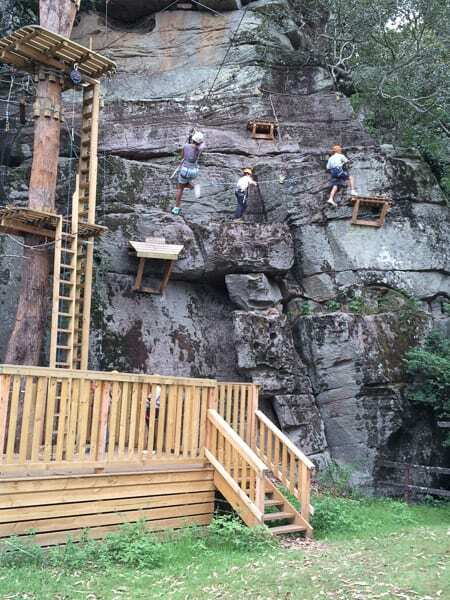 Then they headed over to the other side to climb up and do the black course. I had adrenalin pumping just watching them. I sent my iPhone up with them and here are a few snaps Paul took whilst up on the cliffs and amongst the treetops. It looks pretty scary, doesn’t it? Paul came down looking all proud of himself and a tiny bit spooked. The long abseil down a tree at the end had certainly got his old heart rate up. Dexbox bounced down with all the insouciance of youth and went straight back to do the black course again. I do love my adventurous lads; they’re a chip off the old block. Here’s Dexbox walking back triumphant after his second tour of the black course. He was totally exhausted. It’s a massive workout. 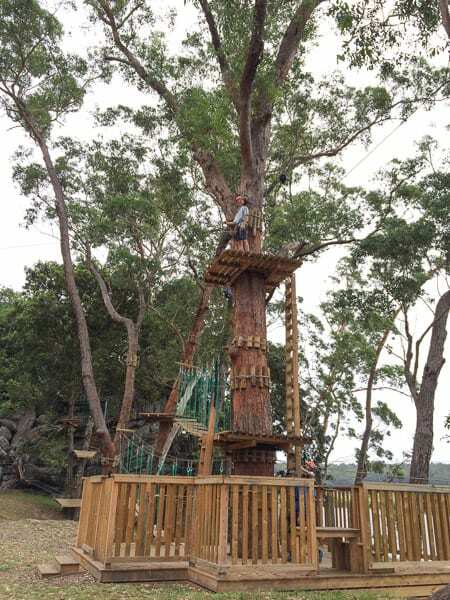 Founded by French climber Nico Dansin and his business partner Marc Flaster, Trees Adventure now has three locations: Nowra, Grose River Park in Sydney and Glen Harrow Gardens in Melbourne. Website: click here The website is very good, bookings can be made on the website. NB You do need to book ahead!! 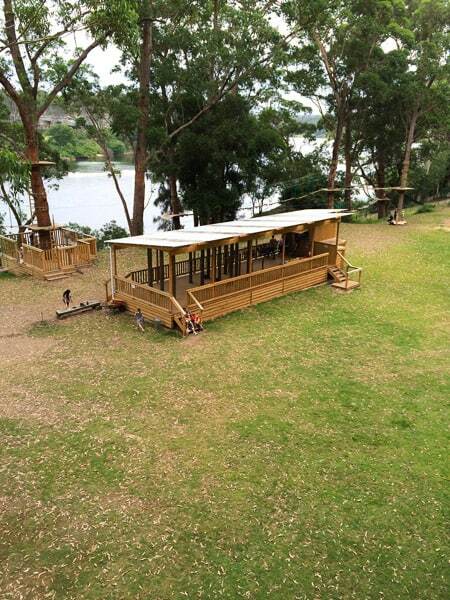 Cafe: In Shoalhaven Zoo you will find the Haven Cafe. You can visit the cafe without needing to pay entry into the zoo. 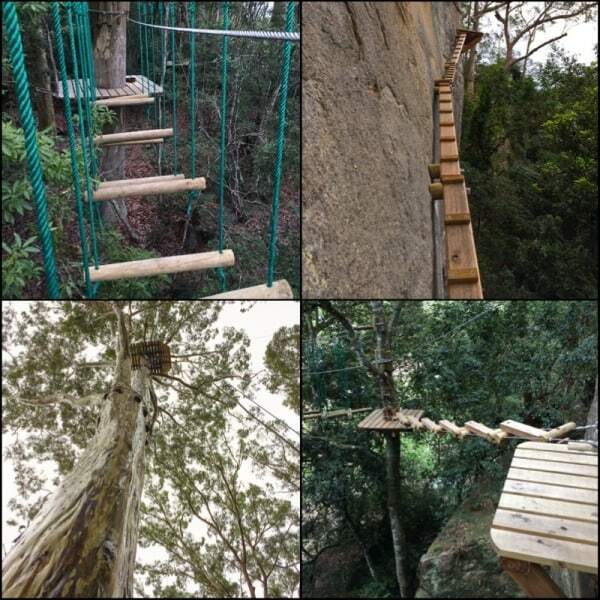 Trees Adventure tickets do not include entry to Shoalhaven Zoo. 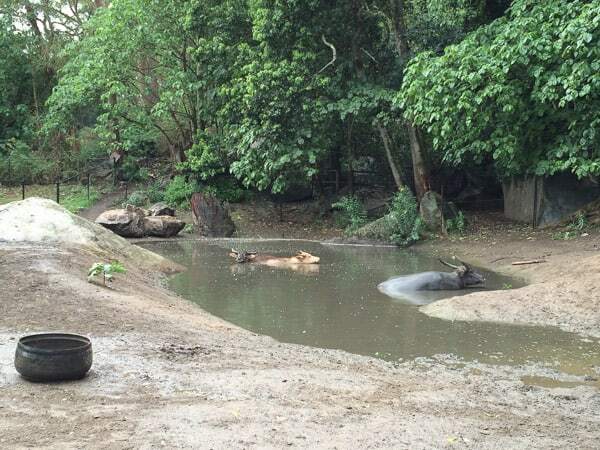 If you’d like to visit, you need to pay entry at the Zoo. Tickets give you two hours on the courses. You can buy gift vouchers via the website. 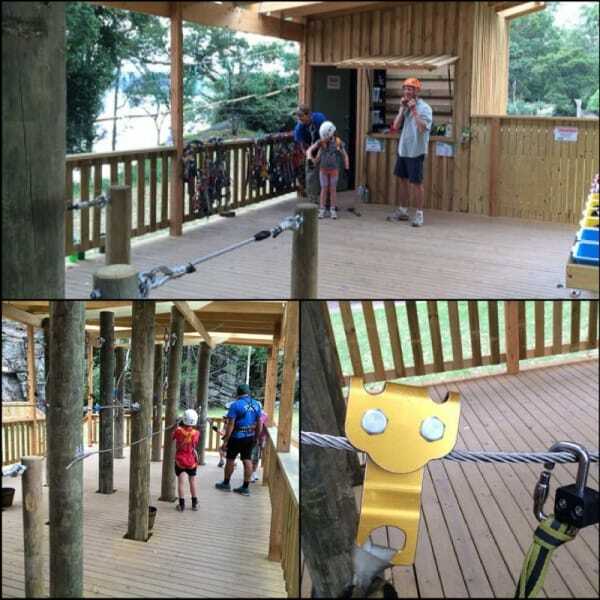 I reckon a visit to Trees Adventure makes a GREAT gift for kids, teens and adults too. 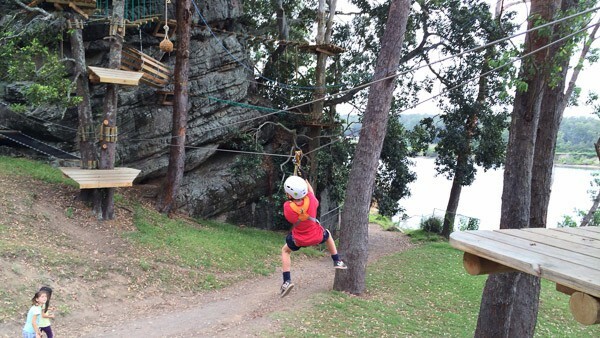 Have you swung through the trees recently? And do you know any insurance companies who’d take on my husband? (They’re all reluctant because he works in Middle East!) I’ve got a few more adventures planned for him and us all! 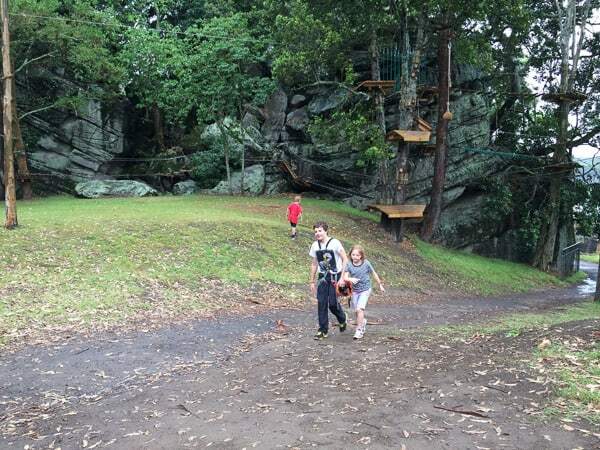 Thanks so much on behalf of myself, hubby, Dexbox and the twins to Trees Adventure Nowra for hosting us. Much appreciated. We are planning to visit that are soon with the kids so it will have to go onto our list of things to do! Thanks for sharing, my kids will love it! I must add it to my post with all our fave things to do down there, it was a list of 21 but I’ll have to redo the title as it’s about 23 or 24 now. Marvellous spot. My kids would LOVE this! 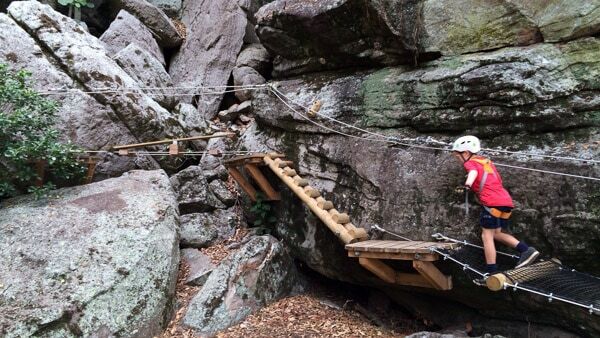 Not sure I could tackle the black course – I don’t handle moving bridges very well. 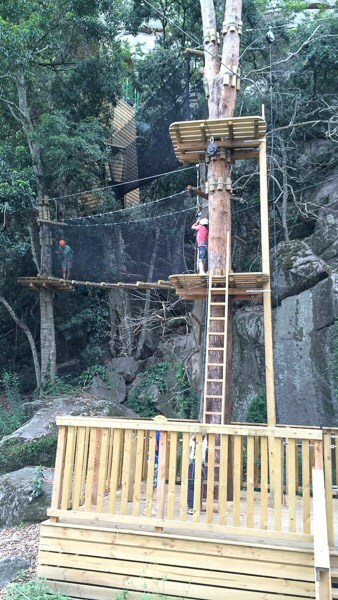 Children and kids will absolutely love this adventurous activities. Even for all ages that are capable of such activities will really enjoy it. Thanks for the lovely photos. These look great to me, and I am sure teenagers would definitely like these challenges! But a bit scary for small children isn’t it? 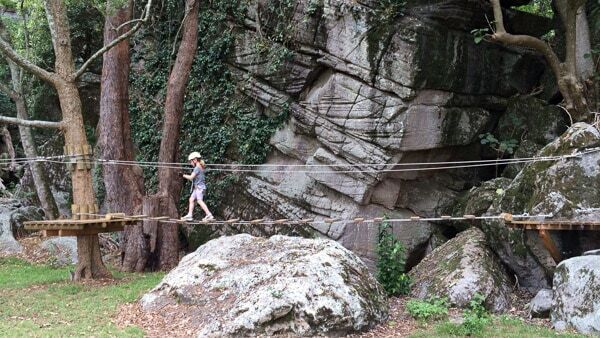 That looks like awesome fun, Seana! Now the boys are 4 (and completely energetic at that!) they would love this place! We’re going to go camping in the South Coast soon. 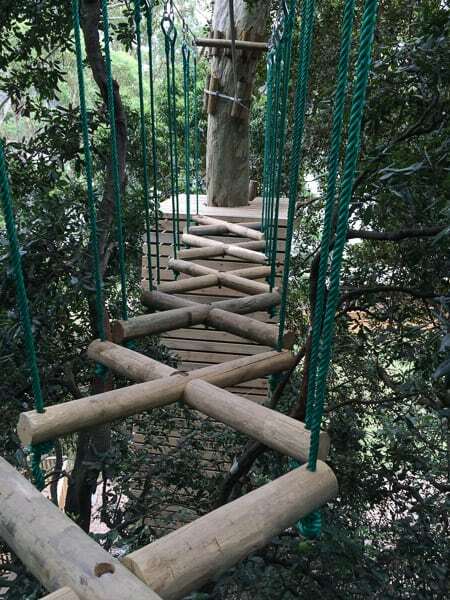 The tree adventures might be a great stopover! That looks great and quite reasonably priced. The iphone shots of the wooden ledge attached to the rock face look very scary. No way would this mama go up, but I bet my kids would love it. PS Also nice that they cater for such a broad age range. Yes, it is good that the little ones can have a go. Paul found it more challenging than he expected… teenager fearless. How fantastic! Little Cheese would be all over this as soon as she turns 4.